Last November, Dave and I made our first joint trip to Santo Domingo, Dominican Republic, my Dad’s hometown. We had an unforgettable time with my family, and every meal was special. I’m thrilled to have a family who is as equally food and cooking obsessed as I am, and chock-full of skilled home chefs. A standout on this trip was lunch on an overcast day, watching the clouds roll in over the ocean. My cousin Michelle took us to Adrian Tropical, a famed mofongo spot on Avenida George Washington in S.D. for, you guessed it, mofongo (and fresh-squeezed tropical fruit juices). Mofongo is a traditional Dominican dish of stuffed, mashed plaintains. The plaintains are fried and mashed with garlic, herbs and spices, and pork rinds, and served heaped onto a traditional wooden mortar. The dish is an incredibly flavorful indulgence, in an umami way; its sum is much greater than its parts. 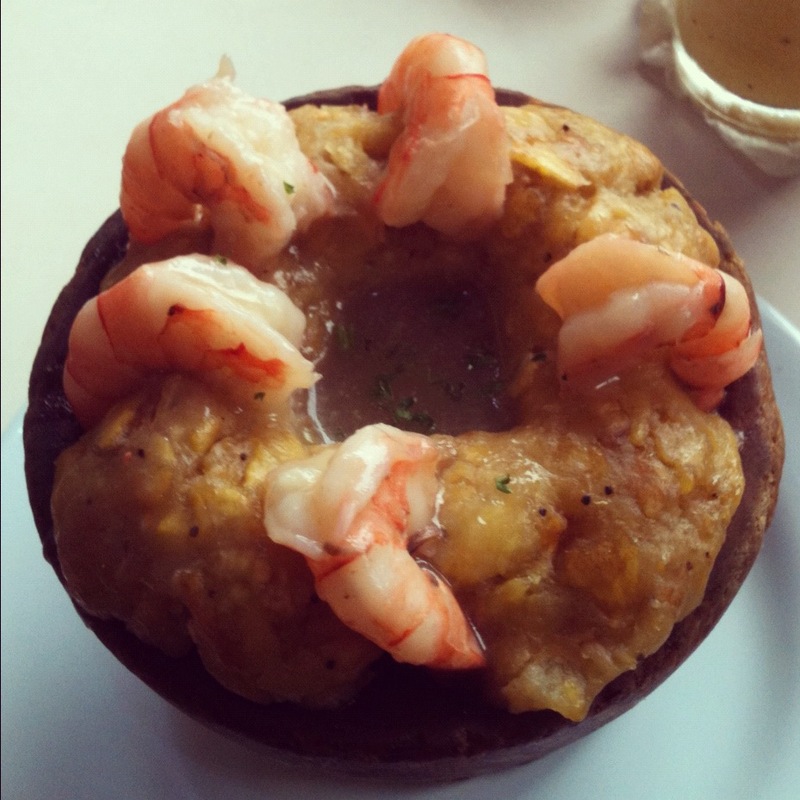 On this visit, I tried a garlicky, brothy new spin on mofongo: camarofongo- mofongo with shrimp! Even though that meal is approaching, you know, 4 months in the past, I crave it daily- ha!! I thought the next best thing to having it flown in or drooling over the picture on my phone any more would be writing about mofongo, and my beloved camarofongo. Note on La Comida Dominicana: contrary to popular belief, Dominican food is not spicy, nor does it involve tortillas (that’s Mexico, folks). Picture a lot of rice, beans, poultry, seafood, platano (plaintains), and bright, savory flavors, served family-style. * If you’re interested in Dominican food and cooking, Aunt Clara’s Dominican Cooking is a great site to visit. Clara is great at not only creating very easy-to-follow recipes, but explaining the significance of each dish and adding cooking tips. She mentions this very camarofongo dish on her website, too- the girl has great taste!! This entry was posted in Dinner, Dominican, Fish & Shellfish, Gluten free, Restaurants, Travel. Bookmark the permalink. What’s served with the shrimp, it looks delicious! It was!! The broth seemed to be shellfish or chicken stock with lots of garlic and some parsley and cilantro, thickened by the platano or possibly a bit of cornstarch.